With the rapid pace of modern society, people enjoy having a bag of french fries/potato chips in their leisure time. Actually, potato chips/French fries have become more popular than other snack food in the global for their crispy and delicious taste. 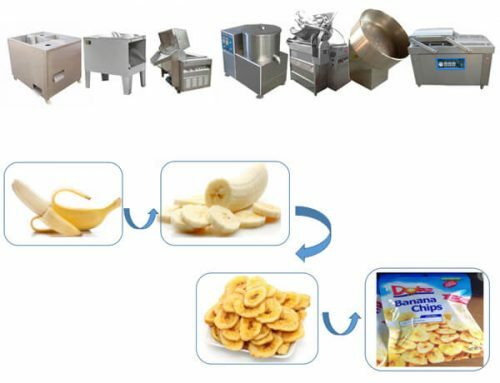 Gradually, potato chips and fries production line has turned into one of the processor’s favorite investment projects. 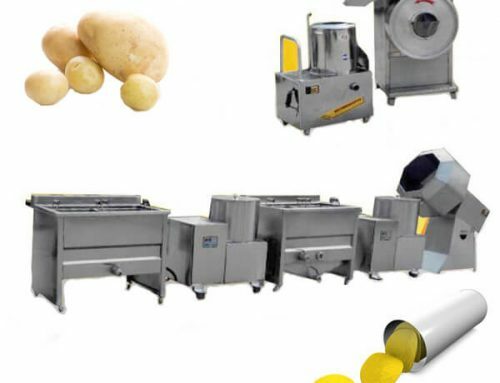 100kg/h potato fries production line can complete potato peeling, cutting, blanching, dewatering, frying, deoiling, flavoring and packing process. This production line has characteristics of less investment cost, quick profit, good product quality, and high efficiency. This line can also be matched with a frozen machine to make frozen French fries, which means with one set of the production line, customers can process at least two kinds of potato product. 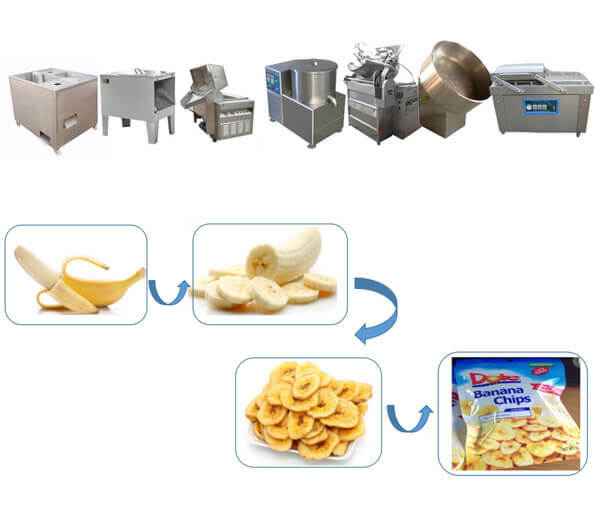 Multiple-functional potato chips and fries machine has realized the purposes of maximum utilization ratio with less investment. 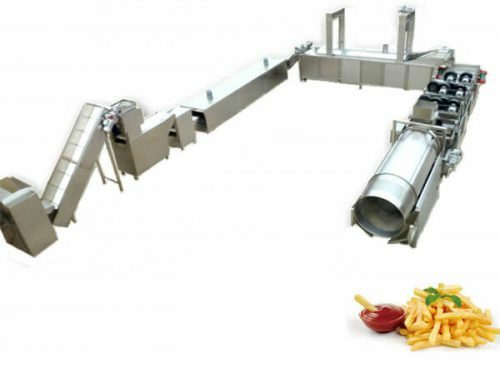 100kg/hr French fries production line mainly contains 8 machines to process fresh potato into deliciously fried potato chips or fries. Drum type potato washing peeling machine adopts the principle of corundum dermabrasion to remove the skin of potato with a high output. 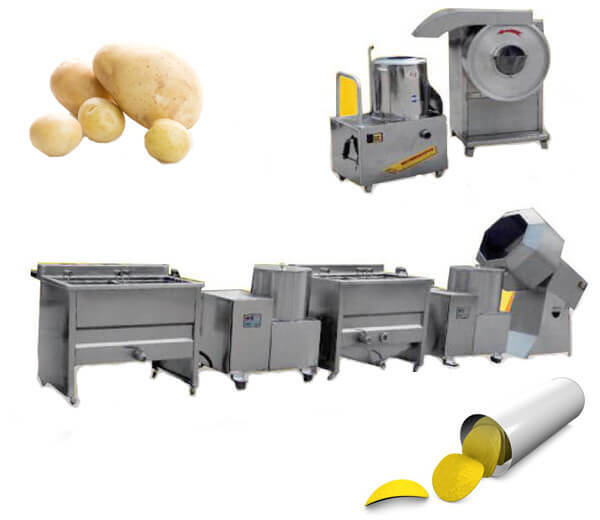 This machine is easily operated and the peeled potato by it has a smooth, clean appearance. Besides applied in potato chips production line, potato washing peeling machine can be used independently in the restaurant, school canteen, etc. 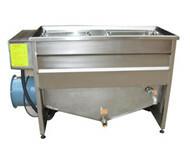 ◊ Washing and peeling machine is entirely made of stainless steel which is durable in long time processing. ◊ The machine can finish washing and removing skins of potato at the same time, the water can rinse out the dirt on potato sufficiently. ◊ Widely applicable in root vegetable and fruit: potato, sweet potato, taro, kiwi fruit, etc. 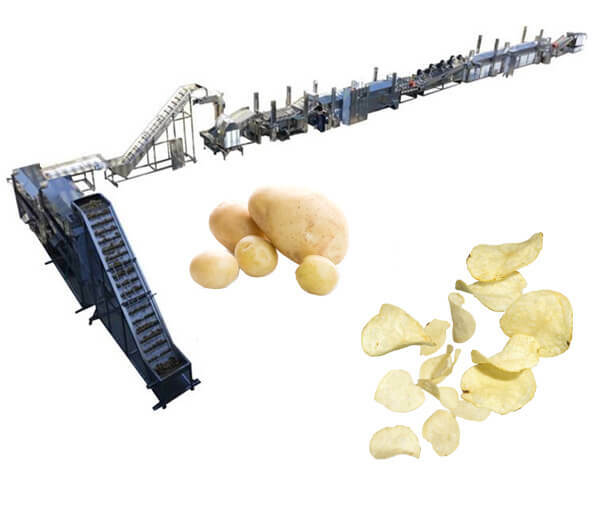 Potato cutting machine can cut the potato into slices, strips and shreds with easy operation and high yield. The cutting thickness is adjustable(from 0.5-10mm) and the processed product has smooth surface & same size without crush. 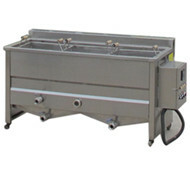 The QS400 cutting machine can replace a manual cut in potato chips plant or applied alone in the restaurant for making a salad or pickled vegetables, etc. 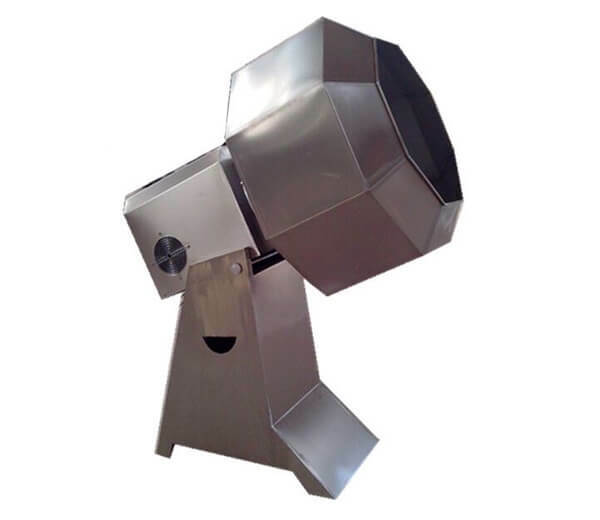 Potato blanching machine is made of entirely stainless steel, it has features of exquisite workmanship, well-developed technology, and simple operation. Potato blanching machine can achieve the purposes of softening food, cooking food, or deodorizing food in different models, PT1000 Potato blanching machine is especially used for precooking potato chips before frying. The blanched potato has a preferable taste, appearance, and color(since the enzyme activities are restricted), which makes blanching machine the most advanced fruit and vegetable blanching, cooking equipment in food machinery market. ◊ Equipped with the automatic temperature control system and with double insulation around its body, and the temperature usually ranges from 70ºC to 100ºC. ◊ This machine also applies to process another vegetable, fruit, and meat. TS500 potato centrifugal dehydrator has anti-vibration design to help defend against machine vibrating when dehydrating potato. It adopts the advanced centrifugal technique to remove the potato’s surface water by the high speed rotating. 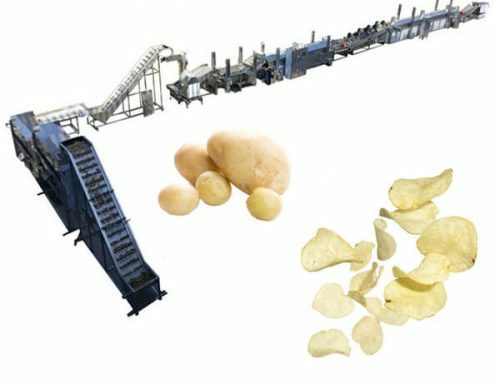 The dehydrated potato is easier to be fried, TS500 water removing machine is the top one choice for potato chips and fries dehydrating, and it is the most advanced fruit &vegetable evaporating machine at present time. ◊ The dewatering machine is equipped with a magnetic brake, it can stand steadily when operating. ◊ The automatic digital control panel device is labor saving. Potato frying machine has various power sources such as electrical heating, coal heating, natural gas heating, liquefied petroleum gas (LPG) heating, etc. Customers can select the suitable one for them: the electrical heating source is easily installed and cleaner than coal heat. The coal heat is basic and can be used under the condition without electricity. The natural gas heating has benefits of less dry air and low occupy space. The liquefied petroleum gas (LPG) heat has a high energy content. ◊ The frying machine has three models: automatic discharging frying machine, automatic discharging frying production line and manual operation. 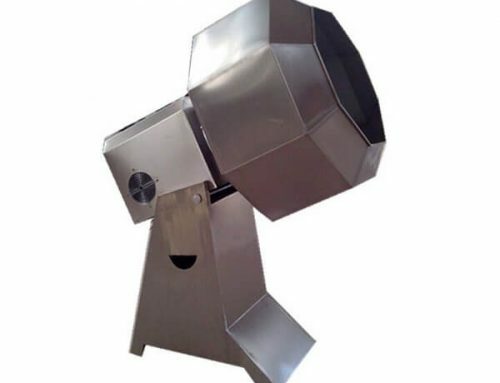 ◊ Manufactured with new oil-water mixture technology, when frying, the residue will sink into the water and be filtered in the bottom of the machine while the upper oil won’t become turbid after a long time frying. Similar to potato dehydrator, TY500 deoiling machine adopts centrifugal principle to take away the surface oil of potato chips and fries by the high speed rotating. The oil removing machine can extend products’ shelf life and reduce weight & transportation cost, thus it is well received as the most advanced oil removing machine at present. ◊ Its deoiling time is automatically digitally controlled which improves products’ quality and taste. BL800 Disc flavoring machine has the elegant appearance and large application range at the same time. 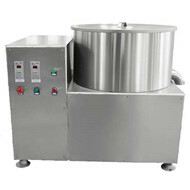 Disc flavoring machine can flavor potato chips, French fries, rice crust, instant noodles, and other snack food, spicy food without mechanical damage, and it is especially good for seasoning potato chips and French fries which makes it highly appreciated by potato chips & fries processing industry. ◊ The machine is made of stainless steel as a whole, this material won’t get rust and therefore the potato chips and fries won’t be polluted. DZ-400/2S vacuum-nitrogen packing machine has two working rooms and it is applied in large quantity products’ vacuum, nitrogen packaging. ◊ The DZ-400/2S packaging machine is suitable for sealing puffed food, fried food, a local specialty, aquatic product, medical drugs, chemical materials, etc. ◊ The material in solid, powder or liquid form can all be packaged by vacuum-nitrogen packing machine.